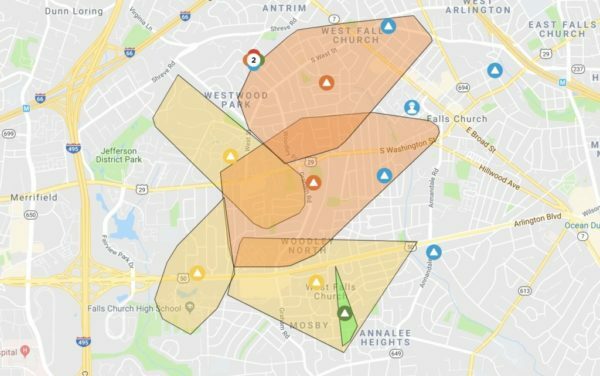 More than 5,000 Dominion customers are without power in the Falls Church area on the coldest morning of the season so far. Dominion reports that some 4,000 customers are without power in Fairfax County and nearly 1,800 are without power in the City of Falls Church. The cause is listed as a “damaged power line” and restoration efforts may stretch into the afternoon. Via Twitter, the city said it had deployed generators to key intersections where traffic signals were dark. It encouraged residents who did not have heat to take shelter at local libraries or community centers, while also encouraging residents to check on vulnerable neighbors. POWER OUTAGES THURSDAY AT 8AM :: @DomEnergyVA reports a number of power outages in the City. We are deploying generators to a number of traffic signals; please pay attention and be cautious.